After growing up on a farm in North Lincs John was attracted by the bright lights of Manchester at the turn of the century. He attempted to play drums in a few discordant bands through school and college before realising he was a better listener and could have more fun in a mosh. A reader first and and self confessed Rule Geek who enjoys poring over codexes and spends far too long painting. John hates the taste of Badab Black. It’s now been 10 months since I agreed to paint up some classic metal ‘stealers and Termi’s to go with a full set of Space Hulk tiles obtained from eBay. 10 months and I’m still not finished, although getting tantalisingly close. I’m the first to admit that I’m a slow painter in general, but this delay has arisen more from a lack of general painting inspiration than any physical slowness. There is however a new box recently dropped that once again has the gaming community abuzz with excitement, or at least has gripped those who missed the last limited edition run; and there’s nothing like a bit of communal excitement to get motivated and gather supplies. I need to begin with a preface, I’ve not yet managed to get any games in with 7th ed, and only read through the new rules once. This isn’t a intended as review, or detailed breakdown of old vs new, isn’t a soapbox from which to espouse “the sky is falling” or bemoan the nerf-bat. Instead, this is just musing on the changes that jumped out as having an immediate affect on how I play evil space elves on the tabletop. PuppetsWar are for some a company that will need no introduction. Which is good because outside of being based out of Warsaw, Poland and knocking around since early 2010 they give little away on their website and simply let their product do the talking. No frills, just “this is what we do”. For those not familiar you’ll find the usual fair of GW compatible weapons and accessories through to alternate troops, bikes and tanks with thinly disguised names that will crack a smile, including shoulder pads for “Planet Devourers” and Emperors “Demon’s Children” or a certain flyer named “Thunder Crow”. 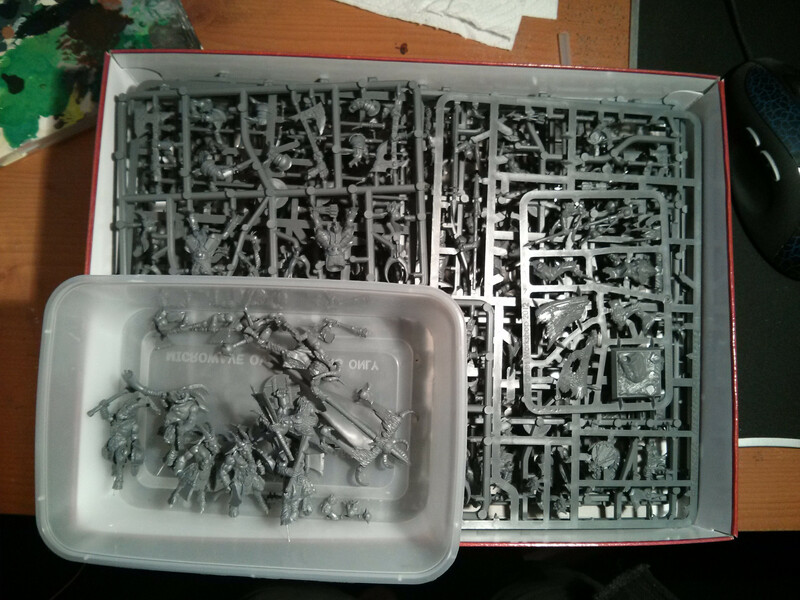 I’ve certainly been tempted to pick up some bits to make a start on some Thousand Sons, but it’s one of their recent releases that tempted me to take the plunge. 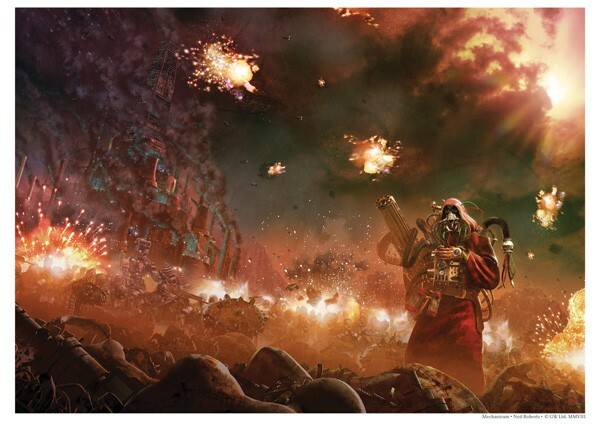 So I got to chatting with Mark Bedford & Rob MacFarlane about Mechanicum forces at Games Day. Do you know the one thing I took away from those guys? Excitement. Excitement for the scope and boundaries they were able to push; whether that’s using entirely CAD sculpting methods (ala the new TAU R’Varna) to compliment the straight lined Mechanicum aesthetic, or the blank canvas that goes along with an absence of any comparable GW existing model range the future of the Mechanicum looks bright. It’s now been over a month since I put metaphorical pen to paper and started my erstwhile tale, so it’s time for an update of my trials and tribulations, and more importantly my progress towards the first 500 point mustering of a Bray Herd. In short, it’s not gone well. I’m a big believer that no matter how good the paint job, every model looks half done until it’s based. Clear flying stands mitigate this to an extent but I still prefer a proper base and like the extra dynamism this can lend to a model. To see it in it’s habitat if you will. 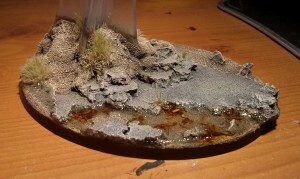 I also dislike the idea of dropping a fortune on resin bases for an entire army. 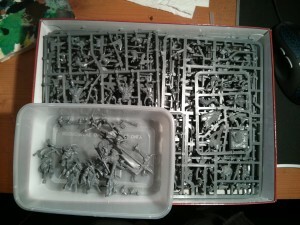 I can cope with a few for skirmish games, but for anything larger scale any hobby money is for paint and models right? With that in mind my basing efforts have definitely improved over the years, from the ubiquitous Goblin Green with flock in the early 90s to today’s efforts, and so far I’ve resolutely ignored requests for a step by step. Partly because I get engrossed and forget to stop to take photos and partly due to a lack of any creative outlet. Well Corehammer’s the perfect outlet, I had a flying base that needed some attention, so time bust out the camera and get cracking. Or at least that’s what Ron Perlman’s told me on multiple occasions. Whether it’s a long time ago in a galaxy far away or the Grim Darkness of the far future it’s not a pretty thing. It’s not subtle, unforgiving and damn straight it’s messy as hell.